Hello friends! I had a good time blogging about my favorite things last year so I'm going to do my best to continue that trend in 2019. I don't know if anyone actually reads these but I find it really cathartic to write things down and it's fun to look back and see what things past-me was enjoying. I love finding out about new books, games, and movies from other peoples' recommendations, so maybe i'll mention something that peaks your interest. Or, just as likely, you'll completely disagree with my hot-takes on angsty werewolf romances or fish based adventure films. That's fine too. Aquaman is strange. It's filled to the brim with cliches and painfully awkward dialogue, it's way too long, the first half of the movie is a rocky jumble of exposition that is a slog to get through, and nearly every emotional moment is undercut by a random explosion (seriously, it was like a running joke). Yet bizarrely, inexplicably, I rather liked it? It's a James Wan movie, so of course there are some impressive visuals and great color - in particular a bonkers epic sea battle and a creepy voyage into the "trench". But other than that, I honestly can't really pin down why all those problematic elements, which 9 times out of 10 would have turned me off of the movie, instead made me smile. Maybe it's just how far they decided to lean in to the melodrama and ham? How much screen time was spent focused on Jason Mamoa's bare chest? How Aquaman literally saves the day by talking to fish? I have no idea, but I can definitely see this becoming one of those movies that I end up watching a bunch of times while i'm working. I also got to see a special theatrical screening of Pride and Prejudice (2005) at the local Alamo Drafthouse. It is one of my favorite movies but I didn't see it in the theatre when it first came out. I had a blast watching it on a big screen surrounded by a bunch of other people who swooned and laughed in all the right places and I think it made me like the movie even more. The tagline for this game is "A story-filled physics puzzle game where you play as a hole in the ground". Said hole is controlled by a raccoon named BK who doesn't see why it's such a big deal that he's dropping everyone and everything into the depths of the earth. The entire game takes maybe 90 minutes to play and I loved it to bits. Somehow this puzzle game about a raccoon moving holes around manages to have a remarkably funny, engaging story. Plus the graphics are charming. I think there is a more expensive console version of the game but I played it on my iPad and that worked just fine. Definite recommendation here. Ravensong is the second book in TJ Klune's Green Creek angsty werewolf series, the first of which (Wolfsong) was one of my favorite books of 2018. Book two focuses on the angry, tattooed witch Gordo as he pines for and rebuffs the love-of-his-life werewolf boyfriend who abandoned him many years ago. Plus, you know, evil werewolf hunters, intrigue, magic, bad dads, shapeshifter politics, smooching, FEELINGS, and melodrama. I love this series. On the other side of the romance spectrum, with absolutely zero werewolves, is Seven Summer Nights. Set in 1946 in the rubble of WWII, this book follows a disgraced archeologist suffering from severe PTSD, who takes on what is supposed to be a small job surveying a rural church. While there he befriends the local vicar and the two slowly fall in love while working together to solve a mystery involving ancient ruins, magic, and witchcraft. The two lead characters work really well together and the book puts a lot of value in redemption and healing. There are action bits, some unexpected supernatural elements, a town full of secrets and history, and a really sweet, well built emotional romance. I'm feeling a bit more motivated than I was last year so that's definitely an improvement. 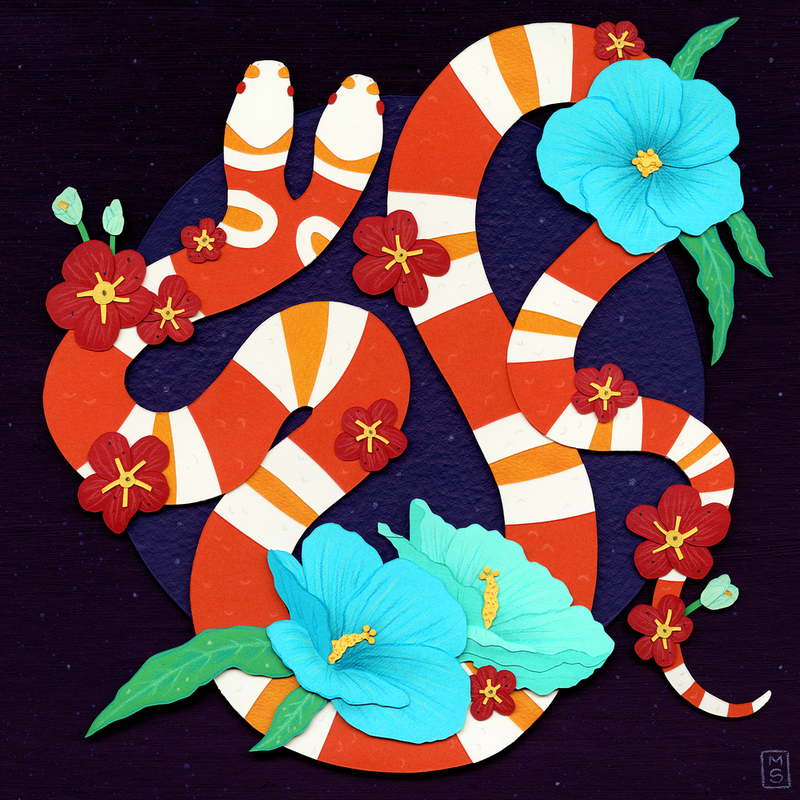 I managed to finish two collages in January and while I can't quite share the first one yet, you can see the second one (a flowery, two-headed snake for a stripes-themed show at Gallery 9) up at the top. I'll be posting a start-to-finish Patreon video about that snake very soon.